When it comes to reducing your Florida moving cost, Big Boys Moving and Storage have been working in the Tampa area for years and during that time we have picked up more than a few great money saving tips! Today we’re going to share a few of the best ways that you can save money when planning your upcoming Florida move! Top Tips to Reduce Your Florida Moving Cost! Some moving companies, like us here at Big Boys Moving and Storage, offer bundle prices on moving services. For example, we offer discounts when you bundle our packing and moving services and use our moving boxes! When you bundle our services together you don’t just save yourself money, you also save yourself time, stress, and the possibility that the bottom will fall out of those repurposed grocery store boxes! Coupons and moving specials can save you a ton on moving costs too, but so many people don’t think to ask their moving company if they offer these types of discounts! Here at Big Boys Moving and Storage, we always try to have multiple coupons and specials available for our clients because we know how expensive moving can be. Interested in learning about our current specials? Check them out here. Depending on the movers you use and the services you select, you may be eligible for additional discounts based on your membership in clubs or associations, or your status as a senior or veteran. It never hurts to ask if you are eligible for a discount due to these affiliations, you never know, it could save you a bundle! If money is really tight and you have the time to spare, consider packing up your own home rather than having movers do it for you. While we offer very reasonable rates on our packing and moving services here at Big Boys Moving and Storage, we understand that sometimes you’re working with a less than ideal budget. In these cases, we recommend packing up your own belongings (carefully) and hiring the movers for the moving portion of your relocation only. Depending on where you are moving to or from, labor-only movers might be another way that you can cut costs. In this instance, you would hire a POD or similar containment unit and then pack your own belongings. Leaving your boxes all packed and taped and ready to go, you just have to have your movers come in and pack those boxes into your moving container for you. Here at Big Boys Moving and Storage, we can even store those moving containers for you in our secure storage facility! Depending on the time of the week and the month during which you plan on moving, your moving cost may be higher or lower. Talk to your moving company and ask when you might be able to get a better rate for your move. Is there a better time during the week to move? A better month to move? If you can be flexible with your moving date, you can take advantage of any additional savings by bumping your moving date a day or week ahead. By getting everything in order for your moving day and having it ready for your movers, you will reduce the amount of time that it takes them to move you to your new home. By cutting down the time it takes for your movers to get your items moved, you cut down the amount that you pay for hourly fees! How can you get things in order? Have everything packed before the movers show up on moving day! Clearly label all of your boxes with the room they are from, the room they will go to, and the number count of the box. Doing this will not just help your movers to get things where they need to be in your new home, but they will also help you when it comes to unpacking! Going with amateur moving companies might seem like it will save you money, but in the long run, it will wind up costing you even more. Why? Because professional movers are licensed, insured, and bonded, and they have the experience needed to properly move you into your new home. Amateur moving companies, however, usually aren’t bonded or insured and this means that any breakage of your items or theft by one of the amateur movers, is not covered. This means that if you want to recover the cost of damages or of stolen items, you will have to pursue the movers in court which will wind up costing you far more than you ever bargained for. Hiring a professional moving company like Big Boys Moving and Storage, however, guarantees that you are covered in the event of any mishap. Plus, we have been working in the Tampa area for so long, we have a reputation behind us that speaks for itself! You never need worry about anything with our experience on your side! Looking For a Top Quality Florida Moving Company? 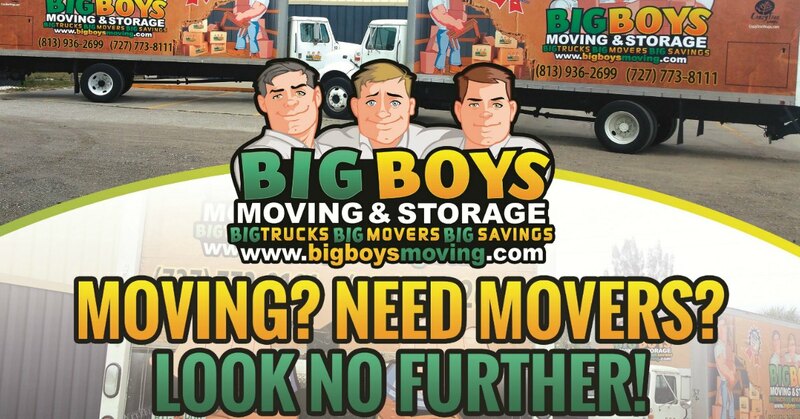 Big Boys Moving has been voted top moving company in the Tampa area for nine years in a row! Not only are we the best, but we also offer our moving services at the most competitive prices so that you can afford the moving services that you deserve! Just pick up the phone and give us a call at 813-936-2699 today!